Who is in charge? Who is in charge of your life? Our western culture takes immense pride in the concept that it is all about us, that I (capital I of course) am entitled to the choices of life. That I am entitled and best qualified to chose the course of my life. While God has blessed us each with our free will it is a myth of fools to pretend we are in charge. It has been said if you want to make God laugh tell Him your plans. Yes, while God does give us free will our Creator, the Shepherd of our souls also gives us the ability to know we are…Followers..we choose to follow. In today’s Gospel Christ makes clear that we are sheep and that He is the Good Shepherd. He also makes clear the reality that there is evil, that Satan would seek to lead us astray, to rob, destroy that which is treasured and made by God. This brings us to ask, if we are honest, who is in charge? Who is guiding my life? As we look to Christ, as we look to the Good Shepherd we learn what it is to follow Him. First we come to learn Jesus knows His sheep. He knows each human soul, created by Him. Christ, Lord, God, Savior, Shepherd knows…..you. Whether we are the purest of spotless white lambs or if perhaps we may be the odd sheep of the flock, the proverbial black sheep. He knows, He created, He loves us for who we are. He knows and calls us each by name. Well He knows the paths we may have wandered, the wounds or struggles we have encountered. Yet His love never ceases. He calls, searches..seeks to bring us each into the fullness of His love, the safety of His fold. As we heed Word, His voice, as we yield to the loving guidance of His staff He leads us home to Him. As sheep of His flock, as His followers, the guidance of Christ’s Spirit brings us ever closer into His Kingdom. Our Psalm today is a powerful prayer and confession of the faithful. While most often heard at a funeral we need to remember that if we think to wait until death before we start to follow Him, it may be too late, or at least we will have missed the fullness of life He created us to know. This Psalm of David, a man who knew what it was to follow God, is powerful in its honest confession. Christ will indeed lead us to the lush pastures, abundant waters of which we seek. But, because He is the good Shepherd He will also lead us through the valley of death, those dark nights of faith pressing close to He who leads us. Christ promises, that through His Holy Spirit He will lead us into His will, His path, His truth. This is not just some ethereal mystic hope. It is the promise to lead us with the wisdom of God, daily, taking up the Cross He shares to lead us, in our hearts, our families to do His will to love as He loved. And it is as we yield to His voice calling our name, as we follow Him we come to learn the Shepherd provides for all we need as we follow His way. As we follow the Good Shepherd, as we follow the Risen Christ we soon learn He leads to the impossible. The God Shepherd leads us beyond our own limited resources and abilities to ….trust, to love…to know He will never forsake us. It is when we sit at the table, abundantly set for us, even at times in the presence of our enemies, we learn how faithful God is. We learn that, thanks be to God we don’t always get that to which we are truly entitled. We find instead God’s mercy, healing and love. We learn, Jesus is in charge. He is risen. He is Lord. 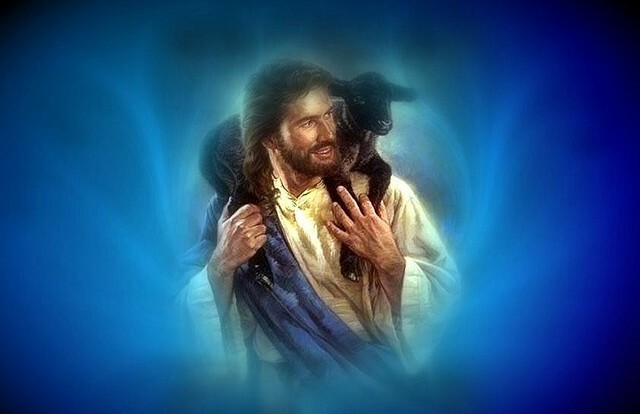 He is my Savior and Shepherd.